You must be of neutral or good alignment. Mages must worship Solinari or Lunitari, and agree to the Conclave Clause. The Wildrunners have a long history that stretches back through the millennia, back into the Age of Dreams. The originally were a part of House Protector, the major House of the Silvanesti that were charged with protecting the lands of the Silvanesti, as well as members of House Royal. During the reign of Sithel, the second Speaker of the Stars, the Wildrunners were lead by a young Kith-Kanan, youngest son of Sithel. Kith-Kanan was a wild youth, often disappearing into the woods for days at a time. During one such adventure into the Khalkist Mountains, he became one of the first people to befriend a wild griffon. With his griffon, he became he more mobile, now outriding as far away as the borders of Ergoth. Constantly traveling through the forests, he found other people; Humans, Dwarves and the wild Kagonesti Elves, and befriended them. In this, Kith-Kanan was much more open-minded than most Silvanesti. This open-mindedness extended to his fellow Wildrunners, who were soon intermingling with these other races, and sometimes even interracial marriage occurred, giving rise to Half-Elves. This mixing of races was obscene to most Silvanesti, who rarely traveled outside the city and were not much exposed to other races. But as the Ergothian Empire expanded westward into the Elven forests, clashes started becoming frequent. Things came to a head when during an expedition to the northern forests, Sithel is killed by a human hunter. His oldest son Sithas becomes the new Speaker and declares war against the Ergothians. But Kith-Kanan has fallen in love with a human woman, and along with many of his people, who have distanced themselves from the mainstay of the Silvanesti, Kith-Kanan must choose sides. Nobly, he fights alongside his proud race in the terrible Kinslayer Wars. After 40 years of years of fruitless war that sees much death and destruction, the historic Swordsheath Scroll is signed, bringing peace to the land. Lead by Kith-Kanan, the progressive elves secede and become the Qualinesti, bringing the Wildrunners with them into the new nation. Over two thousand years after the death of Sithel, the Wildrunners are still thriving. After the Cataclysm they were mainly a para-military force that guarded the lands of Abanasinia, from Solace down to Qualinesti and east towards Thorbardin. During the War of the Lance, they fought running skirmishes with the Red Dragonarmy as it made it’s way into the Elven lands. Following the war, the devastation of the Silvanesti forest and the gradual reuniting of the Qualinesti with their Silvanesti brethren saw the Wildrunners expanding eastwards over the Plains of Dust and into Silvanesti lands. 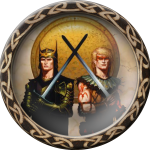 With the new rising threat of the Knights of Takhisis, the Wildrunners again stand guard, ready to repel anyone who threatens their homelands. 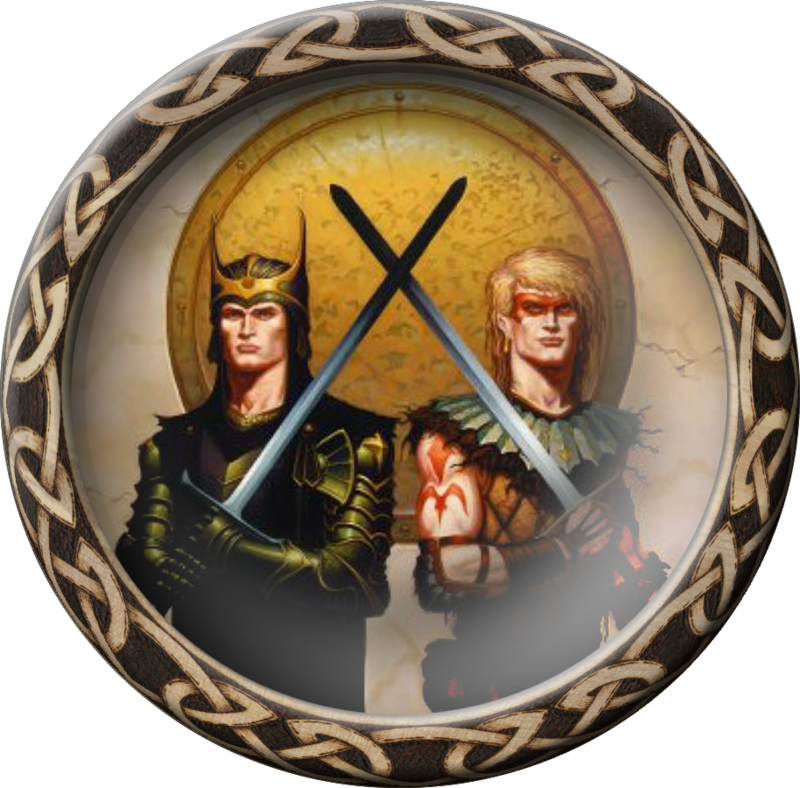 Any class is accepted into the Wildrunners and all can have a role in the clan. Warriors are front-line fighters and are always needed. Paladins and Clerics can bring much needed healing skills and clerical magic into battle. Thieves and Rangers are used for tracking, scouting and spying, plus any other occasion when stealthy, silent movement is needed. Mages and Battlemages can bring powerful magics into battle, as well as protective and warding spells. Elves typically worship Gods of Good alignments, but with the inclusion of other races into the Wildrunners (Humans, Half-Elves, Kagonesti for example) the worship of Neutral Gods is also allowed. Mages and Battlemages are required to worship either Solinari or Lunitari dependant on their alignments. Worship of any Evil God is not allowed. Most Wildrunners come from Elven origins. Applicants must be of some Elven race, Human, or Half-Elven. People of races other than these are extremely rare, and will only be allowed by consent of the Field Marshall and the clan Immortal. Mages may join the Wildrunners through an agreement with the Conclave of Wizards. The agreement states that as long as Wildrunner Mages worship a God of Magic and abide by the Conclaves rules regarding the use of magic, they may freely practice the Art without fear of branding as a Renegade. However, if a mage should leave the Wildrunners and join another clan beside the Conclave, they are subject to the Conclave’s rules concerning Renegades; hunting, attempted conversion, possible attack. Due to the ability to now have two clan affiliations, this is now a moot point. Conclave will always be any mage’s main affiliation. The Leader of the Wildrunners. This person is the commander of the Wildrunners and their armies. They are responsible for the actions of their clan and resolve issues and treaties with other clans. The Field Marshall is also the clan representative to the Immortals. There may only be 1 Field Marshall. These are the elite, most highly skilled of all Wildrunners. They execute the orders of the Field Marshall and are charged with daily running and upkeep of the clan. They lead the forces of the Wildrunners during battle. There may only be 2 Generals at one time. The Colonel may be given command a large geographic area (such as Silvanesti). They may oversee a number of keeps within their Area of Responsibility. They report directly to the Generals. There may be up to 4 Colonels at one time. A Wildrunner who has obtained the rank of Lieutenant Colonel may be given command of a fortress or keep and be responsible for it’s defense. He reports to his ranking Colonel. A number of Wildrunners will fall within these two ranks. They tend to be a bit in limbo, not high enough to command their own keeps, but higher than Lieutenants who lead the troops. Upon reaching the rank of Lieutentant, a Wildrunner may officially lead troops beneath him into battle. Lieutenants continue the mentoring of younger troops throughout their progression. This is the first rank where a Wildrunner may first mentor a lower ranking clan member. The Sergeant has been around and earned his rank and should impart his wisdom to those below him. Despite his skill, he may not yet lead troops in battle. This person has seen a bit of the world and earned a little respect. They have likely seen a battle or two and are growing in skill. These are new initiates into the clan. Green troops that have yet to see battle. This rank is the first rank that all Wildrunners get when they are accepted into the clan. not only encouraged, but mandatory. Player killing (PK) should not be considered a taboo act to be looked down upon if it is done with consistent following of Ansalon’s rules regarding PK and looting. PK must be done within Roleplay (RP) guidelines and is highly encouraged. Anyone found to be violating the rules may be subject to expulsion from the clan and possible loss of equipment by the clan Immortal. As well, grouping with people of opposite alignments (i.e. a Cleric of Paladine grouped with a Warrior of Takhisis) is frowned upon, and the offending person could be considered a traitor to the clan. The only forum for Out of Character (OOC) actions is the OOC public channel.